Hello! I'm SO blessed that you've stopped by my blog today. I'm excited to share this card I created for Really Reasonable Ribbon, and also using some GORGEOUS digital images from Gracielle Design. The base of my card is a green corrugated cardboard that I sprinkled with "snow" on the edges. This "snow" is actually just crumbled styrofoam. 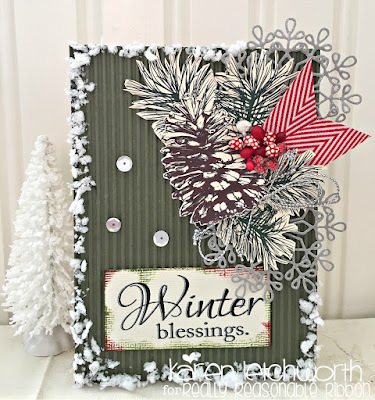 I printed two of the images from the new Winter Blessings Stamp Set from Gracielle Design (Pinecone and Pine Branch) and layered them in the upper right-hand corner of my card by using a fabulous Adhesive called Scor-Tape. I tucked in a piece of Red Grosgrain Chevron Striped Twill and a length of Silver Metallic Twine to give the card some great texture and personality (which ribbons and trims always do). The final touch was adding a couple sequins, and pieces from Red Craft Bead Berry Spray Clusters. 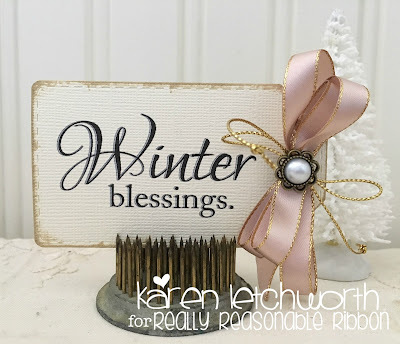 I also printed a sentiment from the lovely Winter Blessings Stamp Set. There are so many FABULOUS ribbons, trims, twines, laces, as well as Embellishments and more at Really Reasonable Ribbon to help you create something AMAZING! And Gracielle Design has so many great stamp sets to help get your creativity flowing. They're a great combination! 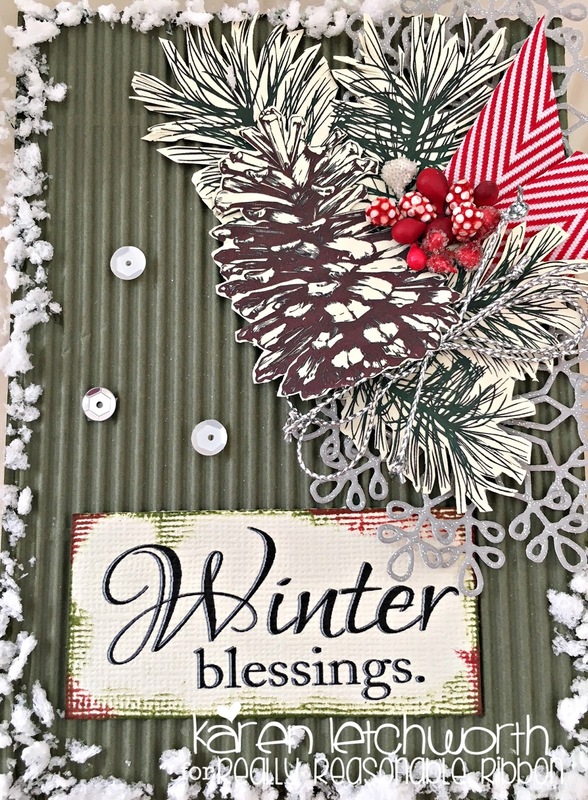 I also created a sweet little Christmas Tag by printing the same sentiment from the Winter Blessings Stamp Set by Gracielle Design on cream card stock. I kept this tag very simple, and just added some of the 3/8" Vanilla Satin With Metallic Edges which can be found in this month's GORGEOUS Ribbon Club Assortment from Really Reasonable Ribbon. The natural tones (3/8" Vanilla Satin With Metallic Edges and 3/8" Lime Juice Satin With Metallic Edge, or 3/8" Buttermilk Satin With Metallic Edge, etc.) are fabulous for choices for adding soft, subtle accents to your projects. I also tied in some Gold Metallic String.....another lovely trim you will LOVE. I topped the bow with a 14mm White Flower Shaped Flatback Round Pearl from the Embellishment selections at RRR. Thanks so much for stopping by. I hope you will visit the Really Reasonable Ribbon Blog again tomorrow (and every day) for more wonderful inspiration, special promotions, and lots of fun. We always enjoy your visits! 25 Days of Christmas Tags - This tag was inspired by a tag Michele Ferguson created on Day 1. She used gold accents on her tag along with natural hues, and it really caught my eye. Thanks for the inspiration, Michele. Simon Says Stamp Wednesday Challenge - Simon Says "Snow White" - I created my "SNOW" by crumbling up styrofoam, running some glue around the edges, and sprinkling it on my card. Karen, both your card and tag are beautiful! Your tag looks so vintage and elegant! Beautiful card and tag, Karen. 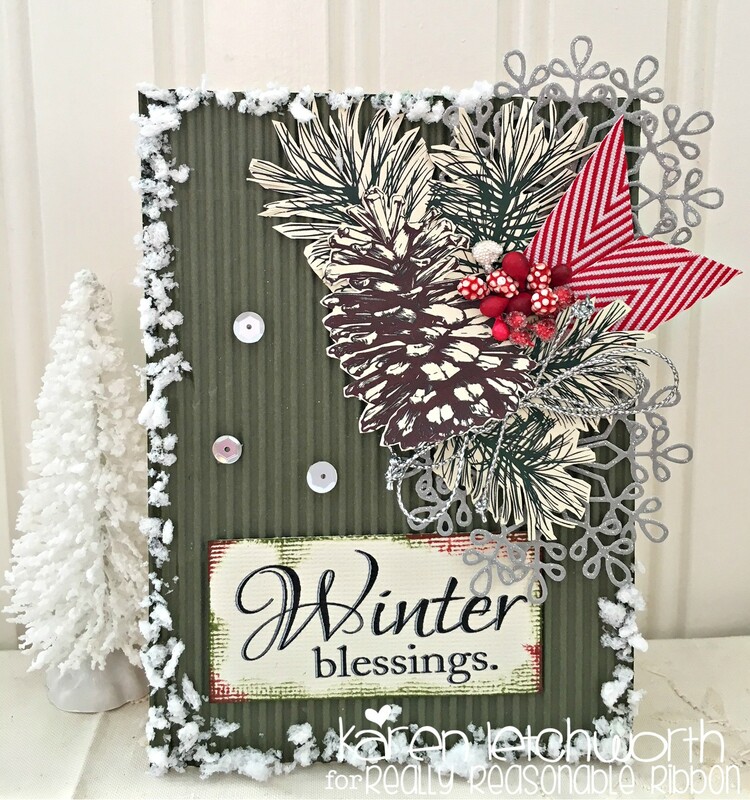 Love the frosty border with Gracie's new Winter Blessings set! Stunning tag...so beautiful and elegant! Thank you so much for joining Tracey's 25 Days of Christmas Tags! Beautiful card and tag. love the stamps and the winter feel. Great snow and greenery .